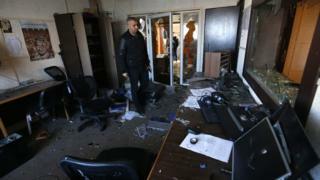 Five men have been arrested after the offices of the Palestinian Broadcasting Corporation in Gaza were ransacked. Thousands of dollars' worth of equipment was destroyed when the armed men attacked the building on Friday. The broadcaster is funded by the Palestinian Authority (PA), which is dominated by the Fatah faction. Staff initially blamed the raid on the faction's rivals Hamas, which controls Gaza, but the Islamist group said unhappy PA employees carried it out. The five men who have been arrested are "employees of the Palestinian Authority whose salaries have been cut recently," the Hamas-run interior ministry in Gaza said in a statement. "It turned out that one of them was a Palestine TV employee whose salary was cut last month," it added. Cameras, editing and broadcasting equipment were all destroyed in the raid. The interior ministry said an investigation had been carried out and the men had been identified by surveillance footage and were all members of Fatah. But officials in the West Bank, which is dominated by Fatah, condemned the incident and said the "de facto authorities" Hamas bore responsibility. The two factions have been at odds since Hamas seized control of Gaza in a brief but violent battle in 2007. In October 2017, the rivals signed a reconciliation deal that was meant to see Hamas hand over administrative control of Gaza to the PA, but disputes have delayed the deal's full implementation.